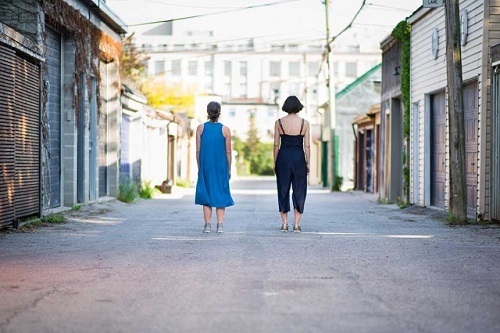 Playing as part of the Summerworks Festival Lab Programming, b side is an unconventional piece that encourages audiences to explore the world around them and find life and artistry in things we walk by every day. Creative duo Molly Johnson and Meredith Thompson guide us through the half-hour using movement pieces interacting with the space. Though far from traditional theatre, it is a thoughtful and liberating experience. To detail the show would take away its magic — the sense of discovery and journey are key to the immersive experience this show is going for. So much so, in fact, I hesitate to call it a show or performance. Through the course of 30 minutes, groups slowly make their way down a Queen West laneway and observe beauty and stories hidden in plain sight or otherwise taken for granted. Johnson and Thompson guide in silence, accompanied by live music by Robbie Grunwald that sets the pace of the journey. For the duration of our walk, whatever the eye beholds becomes theatre, and the boundary between art and spectator blurs. By transforming the way we look at the everyday, this work also transforms it’s participants. The pace and atmosphere of this show is reminiscent of mindful meditation, creating a sense of serenity and curiosity in those walking down the lane. I do wish the show made me feel more free to wander — the creators and volunteers provide a guideline for when to walk, when to stop, and our speed of movement, but I and most of my group felt hesitant to stray too far from the herd. It meant I never felt confused or concerned about where we were going, but I didn’t quite feel like I had autonomy over where I ended up and when. Overall, the immersive and sensory experience that b side delivers is an antidote to the cerebral, cynical performances dominating the independent theatre scene. From a technical standpoint, I appreciate the sustainable, low-impact and therapeutic approach that brings people together and gets them to slow down, breathe, and think. From an artistic standpoint, it is very much what you make of it. b side plays at a secret location – the destination is revealed upon purchase of a ticket.